Many of you have asked me to share my husband and my experience with fasting. It’s important for you to know that these are our personal experiences and are not meant to provide medical advice. Below you will find all the details of what fasting looked like for us and what results we obtained from it. If you have any other questions, comment below or email me and I’d be happy to share any other details you may be looking for. Before you do anything, it’s important to know why you’re doing it. This gives you clarity in terms of what you’re doing and what your expectations should be. It also helps keep you going when you want to quit, because you’re going to want to quit! In my latest blog, I shared how I’ve gone through different cycles with my eating and exercise habits. For several years I was eating 90-100% clean with very few exceptions. But in the last couple of years, I’d say I’ve been operating at a 75%. This means I do less planning and prepping of meals, I cheat more often, and overall I am less mindful about food. I’ve been wanting to clean up my diet, but I hadn’t been motivated to do it. When I heard of the mimic fast, I thought it could give me the boost I needed to get excited about eating clean. Before I agreed to do the fast, I watched a video about the effects of mimic fasting on our bodies. The video was long and full of words I can’t even pronounce, but it helped me understand how mimic fasting is good for anti-aging and avoiding cancerous cells. My takeaway was that we generate a lot of excess cells in our bodies that we don’t need and often those cells are the ones that become cancerous. Mimic fasting helps us get rid of those excess cells. Just like it’s important to declutter our homes and closets, I took this as an opportunity to declutter my insides! Although I can’t know for sure if those five days helped me regenerate my cells, reset my immune system, or avoid cancer, the idea that it could was enough for me to try it. I’m of the opinion that if we can help ourselves get even one percent healthier, it’s worth it. I got this 5 day meal plan from a running buddy of mine. I can’t tell you why the nutritionist who developed this meal plan chose the foods she chose or if this is the best way to implement a mimic fast. I can only share with you that these are the foods I ate. I liked the meal-plan’s simplicity and that allowed me to stay committed to it. I will note that the meal plan calls for one sweet potato every day. I ate the sweet potato on Days 1 and 2, but on Day 2 I measured my glucose levels an hour and a half after eating it and noticed that my sugar spiked higher than it should. Because the point of this fast is to keep your glucose levels from spiking at all, I cut out the sweet potato from my diet for the rest of the fast. Everyone reacts differently to different foods, which is why from time to time I test my blood glucose to see how a particular food affects me. You can purchase a blood Glucose reader at your local pharmacy even if you’re not diabetic and see how your body reacts to the foods you eat. Other adjustments: I didn’t have any coffee during the five days, and I couldn’t get through the 20 olives. I probably ate 5-6 olives. Also, I forgot to eat the almonds for snack on Day 1 but they were a blessing the other days. The first day was the hardest for me, even though I’ve heard that typically the second day is the hardest for others. All I could think about all day was food and how hungry I was. I couldn’t wait to go to sleep. I also had a terrible headache the entire day, probably because I skipped my coffee. Days 2-3 were better overall in that I no longer suffered from headaches and didn’t feel quite as hungry. But I felt hazy and much less productive than I usually am. It helped to be out of the house as much as possible. The first three days I was scared to exercise —not because I thought I was going to faint or anything like that— I was afraid that exercise would make me hungrier. By Day 4 I mustered up the courage to go for my usual run. I felt fine during my run, although I didn’t push myself. I walked a few times when I felt tired. But my suspicions were accurate, I was very hungry after my run. On Day 5, I fasted all morning without any food. At around 2p.m. I reintroduced eggs and kale, and that evening I had cauliflower rice with a salmon burger. I could have fasted all day on the 5th day but once again I exercised in the morning and, after some discussions with my doctor, decided that the afternoon was a good time to re-feed. But I didn’t have my cafe-con-leche until Saturday morning which for me is a daily staple. I was proud of myself for going five full days without coffee! On the morning after my fast ended, I felt revitalized. My skin glowed, I was full of energy, and I felt like the fog had been lifted. I was thinking clearly again! The fast really helped me with sugar cravings and portion control, and it inspired me to continue eating clean. I didn’t want to undo all the good I had done for my body. I also lost three or four pounds during the fast which always feel nice. But beware: as soon as I reintroduced food I gained two pounds back. I don’t recommend doing this fast if your only goal is weight loss. It would be extremely frustrating to spend all week sacrificing to shed those pounds and then gain them back within a few days. Overall my experience with mimic fasting was very positive. Although my husband and I were supposed to start mimic fasting together, he never got around to eating. I think deep down he felt like mimic fasting is more like cheating while you’re fasting. So he did a pure water fast and added a teaspoon of salt to his water in the morning and drank magnesium in the evenings. Like me, all Orlando thought about was food on his first day and he couldn’t wait to go to sleep. Day 2 for him was easier during the day while he was working, but the evening was much more difficult. He managed to exercise on Day 1 and Day 2 which I thought was incredible. By Day 3, however, things weren’t looking good. He had to be in court that morning (he’s a criminal defense attorney) and found himself unable to function properly. He felt dazed and even struggled to articulate his arguments. He realized that he could not continue fasting because it was interfering with his performance at work. He did not exercise on Day 3 and broke his fast that afternoon with some hard boiled eggs, spinach, and beef broth. That evening we checked in with our doctor and he advised Orlando not to exercise during a water fast. He also recommended to spread the salt throughout the day instead of consuming the one teaspoon in the morning. Orlando lost about 5 pounds during his three day fast and then lost another pound the day after re-feeding. But after a couple of days of eating (no carbs or sugars) he did gain three pounds back. Similar to my experience, the main benefit of fasting for him (besides what’s going on behind the scenes on his insides) was that it helped him with portion control and established his commitment to eating a clean diet. In fact, we just celebrated his birthday weekend and he proudly got through the weekend with no major cheats. For now life is back to normal. Orlando and I are focused on exercising and eating lean meats, fruits and vegetables. 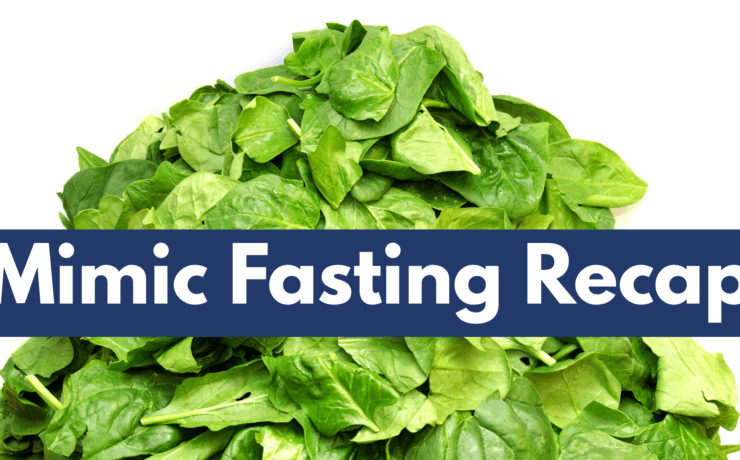 We learned that the best results from fasting happen after you’ve done two or three cycles so our plan is to do a second fast cycle in 25 days. The jury is still out on whether Orlando will do a pure water fast or a mimic fast. I, however, am happy with the mimic fast and not at all interested in the water fast. I hope this recap was helpful in demystifying the process in case you want to try fasting for yourself. Now, I’d love to hear from you. Have you ever fasted? Was your experience similar to ours? Would you want to do it again? What’s your why? Please share your experience as it might help someone else from our wonderful community.